« Homepage / Gourmet / "The $100,000+ Dinner at Emeril’s House"
From hors d’oeuvres of Osetra caviar with Creole corn pancakes accompanied by Clos du Soleil chardonnay, to desserts with lavender honey-glazed figs and a sip of Seven Hills Syrah, it was a magnificent night at the home of Emeril and Alden Lagasse. The pair recently entertained some high-powered guests, all in the name of charity, serving seven exquisite courses, paired with the finest Domaine Serene wines. Last November, Emeril hosted the annual fundraiser for his charitable foundation at the New Orleans Hilton Riverside. He stood on stage next to the auctioneer and addressed a crowd of 600 excited guests in the vast, darkened grand ballroom. 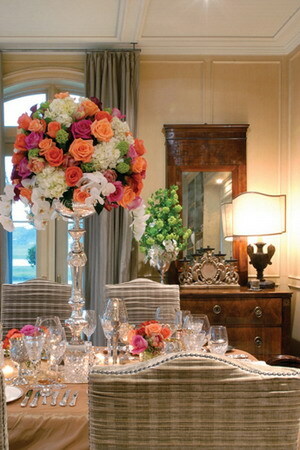 Guests will be seated around the dining table at the home of Emeril and Alden Lagasse in New Orleans. Chef Emeril will prepare an elegant meal and special guests Grace and Ken Evenstad, owners of Oregon’s Domaine Serene Winery, will pour rare vintages from their personal collection. 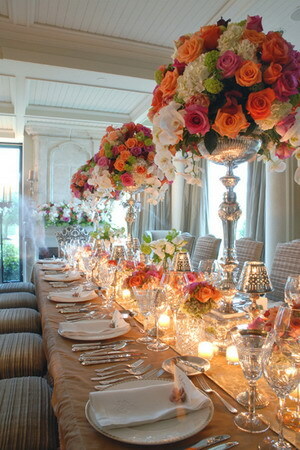 The dinner décor will be designed by Glenn Vesh of Perfect Presentations, to make the evening’s table an unforgettable scene. Fly first class to New Orleans on American Airlines, and stay for two evenings at the graceful Soniat House in the French Quarter, leaving your second evening free to explore the French Quarter in its finest. Transportation to and from Soniat House to Lagasse home included. Donated by Emeril and Alden Lagasse, Grace and Ken Evenstad, Perfect Presentations, Soniat House, and American Airlines. The coveted lot sold to James Schiro, president of Zurich Financial Services, and his wife Tommye. 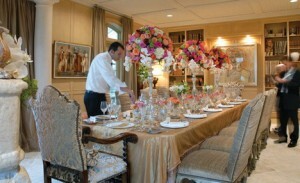 The Schiros enjoyed their $110,000 dinner at Emeril and Alden’s home on March 29, 2008. Guests included the former prime minister of England, Mr. Tony Blair and his wife; former presidents of Poland and Columbia, Aleksander Kwasniewski and Andres Pastrana; and former senator from Oklahoma, Don Nickles and his wife. The gospel group One A-Chord and New Orleans pianist Tom McDermott. 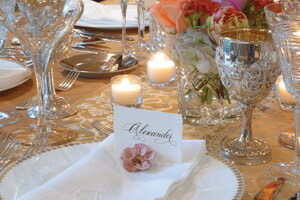 Alden and Emeril worked with Glenn Vesh of Perfect Presentations to select the flowers, the silks, and design for the linens. 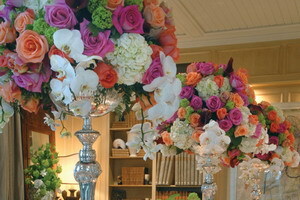 The table featured floral arrangements in shades of coral, chartreuse, and hot pink; peony tulips, viburnum, roses, green and white hydrangea, and sprays of white phalaenopsis orchids in tall silver and marble stands; crystal biscuit jars with individual nosegays, silver candle lamps, and votives. The table was set with selections from the Lagasses’ private collection of new and antique china, crystal, and sterling silver. Lagasse is serious about charity. He established his foundation in 2002 to benefit children in communities where his restaurants operate. The foundation focuses on developmental and educational opportunities for children, and its wide variety of worthy beneficiaries includes Café Reconcile, St. Michael Special School, NOCCA, Covenant House, the Good Shepherd School, and Second Harvest Food Bank. “Emeril and Alden are so generous to offer their home to benefit the foundation, which they care so much about,” says director Shannon. And the Lagasses have to do it all again soon. Due to demand, Chef Emeril doubled the lot, with another dinner being sold to a man from Foxwoods Casino, generating a total bid of $220,000, the highest of the night. 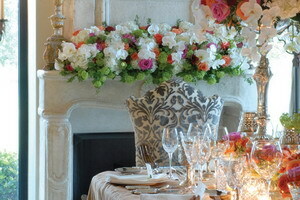 Here you can write a comment to the post "The $100,000+ Dinner at Emeril’s House"